Anyone familiar with essential oils and their benefits probably knows that lavender promotes relaxation, lemon boosts cleaning power, and tea tree disinfects. 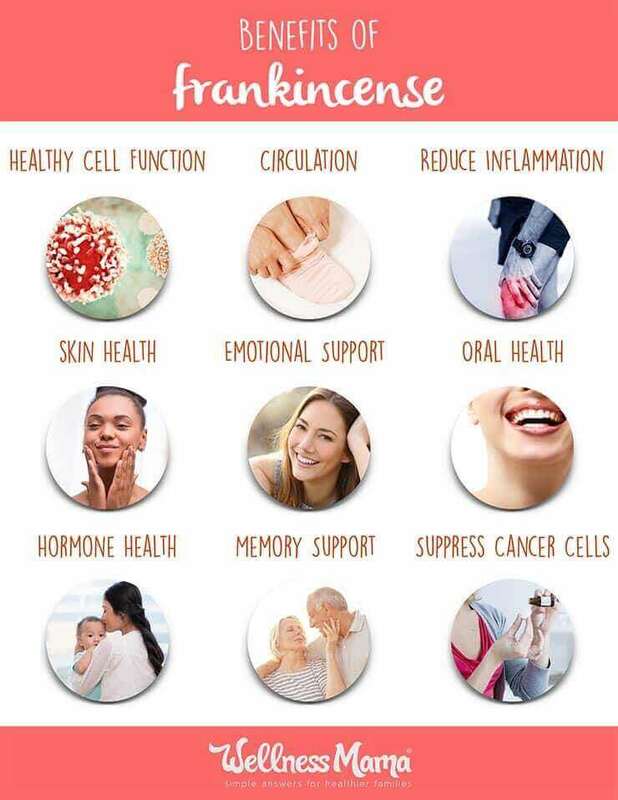 But do you know as much about the benefits of frankincense? This powerful remedy comes from the Boswellia tree native to the southern Arabian peninsula (especially Oman and Yemen), northeast Africa, and parts of India. Long prized for its strongly spicy, woodsy aroma when burned or extracted, raw frankincense is still harvested much as it was thousands of years ago. There are different varieties of Boswellia trees, but most resins (and the oils that come from them) belong to the Boswellia carterii species (also called the Boswellia sacra) found in Oman, Yemen, and surrounding areas. Other varieties include Boswellia frereana (from Somalia) and Boswellia serrata (from India). Boswellia trees are small, scrubby, and have the ability to grow well in dry, rocky areas. To harvest, farmers strategically cut the bark in light horizontal lines. A milky sap oozes out in the shape of small “tears,” or droplets. This can only be done two or three times a year without damaging the tree. After a few years the tree must be given a period of rest to regenerate. Once the sap droplets dry on the tree, they are scraped off and allowed to harden completely over a period of time. This dried sap, or resin, looks like irregularly shaped, glossy, and slightly transparent stones. The larger and lighter the resin, the better the quality. The purest (and most expensive) frankincense resin is almost white and comes from the second “bleeding” of the tree–and even then only under the right weather conditions. We in the Western world typically see lower quality frankincense, which is golden or amber. The monoterpenes and sesquiterpenes are the most valuable elements of frankincense oil. According to the book, “Reference Guide for Essential Oils,” by Connie and Alan Higley, monoterpenes help prevent and discharge toxins from your liver and kidneys, and have antiseptic, antibacterial, stimulating, analgesic (weak), and expectorant properties. Meanwhile, sesquiterpenes can go beyond the blood-brain barrier and simulate the limbic system of your brain, as well as your hypothalamus, and pineal and pituitary glands. The essential oil is made by steam distilling the resin, or “tears” of the tree. This creates a very potent and earthy smelling oil that is typically relatively pricey. This essential oil can be used aromatically and topically for its earthy balsam fragrance. The perfume industry uses this essential oil as well in various fragrances and blends. It is important to note that this oil should not be ingested as large amounts can be toxic when consumed internally, though topical uses are considered generally safe. But why has this particular tree sap and oil enjoyed such an honorable reputation? Records of frankincense as a valuable trade commodity date back to 3,000 B.C. in regions of the Middle East and North Africa. Its history cannot be separated from its ancient and medieval roots, especially in regard to religious rites. Babylonians and Assyrians valued this resin for its intense aroma and white smoke when burned, wafting to heaven as incense in their sacred places. Egyptians used it as incense but also in perfumes, healing salves, insect repellent, eyeliner, and mummification techniques. Around 500 B.C., this prized resin made its way to China, where Eastern medicine practitioners began to realize the medicinal value of frankincense in increasing circulation. Some cultivation of Boswellia trees took hold in southern China but has never become a primary source. 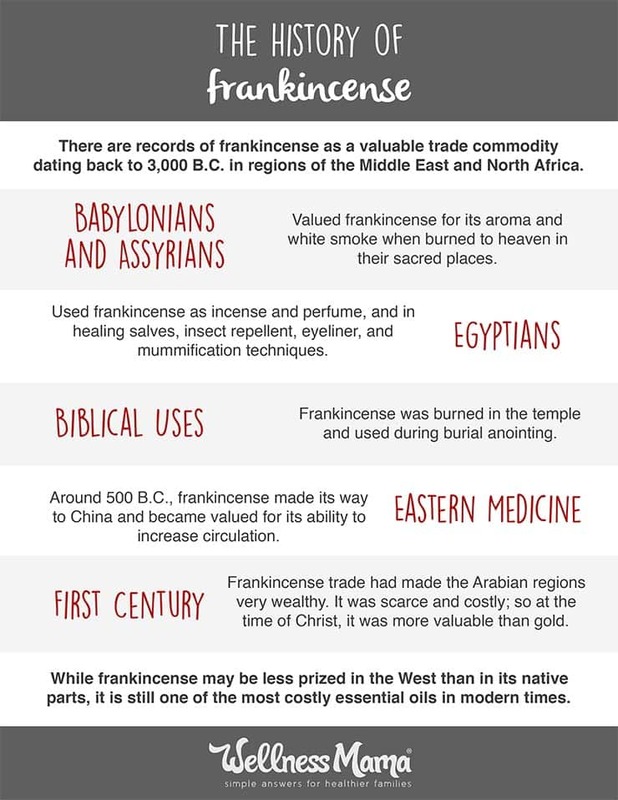 By the first century, frankincense trade had made the Arabian regions very rich. The long, dangerous journey along the Silk Road necessary for trade made it scarce and very costly. At the time of Christ, it truly was more valuable than gold. While it may be less prized in the West than in its native parts, it is still one of the most costly essential oils in modern times. And do you know the smell of a Catholic Mass? That’s frankincense! The burning of this resin still holds a place in the Catholic liturgy today as an incense for special feast days. So besides its aroma, what makes frankincense so alluring? Studies are quite limited in scope, but holistic experts claim quite a few health benefits on the testimony of its long history. Sources claim that Frankincense has the ability to penetrate cells and promote healthy cell regeneration. There aren’t many studies to back this up but a great deal of anecdotal evidence from people who used the oil topically for this reason. Recent studies have tried to narrow in on the reason why frankincense might offer these health benefits. The potent active agent seems to be a property called Boswellic acid, which can be extracted from the resin through various methods. Boswellic acid is a terpenoid compound that mimics the action of nonsteroidal anti-inflammatory drugs (NSAIDs like aspirin and ibuprofen). Since inflammation is at the root of much chronic disease, the anti-inflammatory action of Boswellic acid shows promise for treating diseases like arthritis, asthma, Crohn’s, and even bladder, pancreatic, and skin cancers. Frankincense also shows a lower risk of unpleasant or dangerous side effects compared to NSAIDs. The astringent properties of Frankincense make it an excellent choice for topical uses. Anti-aging products use the oil for the skin benefits. It also may help speed healing of minor wounds and insect bites. I personally use it in homemade beauty products for its scent and for reducing scars or tightening skin. I have a few scars where I had moles removed when I was younger and I’ve been rubbing shea butter and frankincense oil on it to help it fade. Though we don’t completely understand why, this oil seems to promote relaxation and sleep. The effect may be due to the aromatherapy benefits. This is especially relevant with the rising number of disorders related to stress and sleep. The astringent and antiseptic properties of this resin make it beneficial for oral health as well. The resin and essential oil can be used in homemade toothpastes recipes or mouthwash recipes for a natural way to reduce bad bacteria in the mouth. Frankincense is also credited with helping balance hormones and improve memory. I wasn’t able to find any studies that back up this claim, but it is also important to realize that studies on essential oils are expensive and hard to fund. There is some evidence that the compounds in the resin can help balance estrogen production. Many women use it topically for this reason to help regulate menstrual cycles and alleviate symptoms during menopause. One study found that the compounds in Frankincense reduced cyst and tumor formation in the uterus after menopause. Finally, the cancer-protective benefits are the most well-known claim attached to this ancient tree. Research has found a protective effect against some kinds of cancer cells. Emerging research is even showing that Frankincense may halt cancer cell growth and cause the cancer cells to shut down. Cancer starts when the DNA code within the cell’s nucleus becomes corrupted. It seems frankincense has a re-set function. It can tell the cell what the right DNA code should be. Frankincense separates the ‘brain’ of the cancerous cell – the nucleus – from the ‘body’ – the cytoplasm, and closes down the nucleus to stop it reproducing corrupted DNA codes. The researchers have isolated 17 compounds that may produce these effects and as a result are now conducting further studies to identify which one is responsible. There are also claims that frankincense’s cancer-fighting benefits might be overstated or at least widely misunderstood. This ancient tree has a rich history of use for thousands of years. Recent research shows that it may have many benefits in modern times as well. There is still much we don’t understand about how the compounds within frankincense work. Much research remains before we can understand the role of this promising but mysterious substance in alternative medicine treatments. *Note: Most existing studies (see resources below) focus on the benefits of a specific extraction, Boswellia serrata extract (BSE), which is different from the essential oil. Although a few studies claim otherwise, it is possible that the essential oil contains far less (if any) Boswellic acid. This article is a good summary of the difference between extraction methods. I love the scent of frankincense and the earthy, deep tone it adds to oil blends. I also use it in several beauty recipes for its cosmetic and health benefits. This essential oil pairs nicely with lemon, lavender, patchouli, cedarwood, sandalwood, black pepper, ylang ylang, pine, rose, and of course myrrh. Play with different combinations and find your favorite! It’s important to always use high quality essential oils, as the cheaper options tend to be diluted are are less effective. I personally used both the resin and essential oil. Of course, I can’t write a post on essential oils without a reminder that they should be applied with care and caution. Always dilute in a carrier oil and only apply topically. It is also extremely important to avoid the use of frankincense if you are pregnant or nursing (without consulting a practitioner first), and do not diffuse around babies and small children.